"The Singularity" redirects here. For other uses, see Singularity (disambiguation). The technological singularity (also, simply, the singularity) is a hypothetical future point in time at which technological growth becomes uncontrollable and irreversible, resulting in unfathomable changes to human civilization. According to the most popular version of the singularity hypothesis, called intelligence explosion, an upgradable intelligent agent (such as a computer running software-based artificial general intelligence) would enter a "runaway reaction" of self-improvement cycles, with each new and more intelligent generation appearing more and more rapidly, causing an intelligence explosion and resulting in a powerful superintelligence that would, qualitatively, far surpass all human intelligence. The first use of the concept of a "singularity" in the technological context was John von Neumann. Stanislaw Ulam reports a discussion with von Neumann "centered on the accelerating progress of technology and changes in the mode of human life, which gives the appearance of approaching some essential singularity in the history of the race beyond which human affairs, as we know them, could not continue". Subsequent authors have echoed this viewpoint. I. J. Good's "intelligence explosion" model predicts that a future superintelligence will trigger a singularity. The concept and the term "singularity" were popularized by Vernor Vinge in his 1993 essay The Coming Technological Singularity, in which he wrote that it would signal the end of the human era, as the new superintelligence would continue to upgrade itself and would advance technologically at an incomprehensible rate. He wrote that he would be surprised if it occurred before 2005 or after 2030. Four polls, conducted in 2012 and 2013, suggested that the median estimate was a 50% chance that artificial general intelligence (AGI) would be developed by 2040–2050. In the 2010s, public figures such as Stephen Hawking and Elon Musk expressed concern that full artificial intelligence could result in human extinction. The consequences of the singularity and its potential benefit or harm to the human race have been intensely debated. Although technological progress has been accelerating, it has been limited by the basic intelligence of the human brain, which has not, according to Paul R. Ehrlich, changed significantly for millennia. However, with the increasing power of computers and other technologies, it might eventually be possible to build a machine that is more intelligent than humans. If a superhuman intelligence were to be invented—either through the amplification of human intelligence or through artificial intelligence—it would bring to bear greater problem-solving and inventive skills than current humans are capable of. Such an AI is referred to as Seed AI because if an AI were created with engineering capabilities that matched or surpassed those of its human creators, it would have the potential to autonomously improve its own software and hardware or design an even more capable machine. This more capable machine could then go on to design a machine of yet greater capability. These iterations of recursive self-improvement could accelerate, potentially allowing enormous qualitative change before any upper limits imposed by the laws of physics or theoretical computation set in. It is speculated that over many iterations, such an AI would far surpass human cognitive abilities. Intelligence explosion is a possible outcome of humanity building artificial general intelligence (AGI). AGI would be capable of recursive self-improvement, leading to the rapid emergence of artificial superintelligence (ASI), the limits of which are unknown, shortly after technological singularity is achieved. Good's scenario runs as follows: as computers increase in power, it becomes possible for people to build a machine that is more intelligent than humanity; this superhuman intelligence possesses greater problem-solving and inventive skills than current humans are capable of. This superintelligent machine then designs an even more capable machine, or re-writes its own software to become even more intelligent; this (even more capable) machine then goes on to design a machine of yet greater capability, and so on. These iterations of recursive self-improvement accelerate, allowing enormous qualitative change before any upper limits imposed by the laws of physics or theoretical computation set in. A superintelligence, hyperintelligence, or superhuman intelligence is a hypothetical agent that possesses intelligence far surpassing that of the brightest and most gifted human minds. "Superintelligence" may also refer to the form or degree of intelligence possessed by such an agent. John von Neumann, Vernor Vinge and Ray Kurzweil define the concept in terms of the technological creation of super intelligence. They argue that it is difficult or impossible for present-day humans to predict what human beings' lives would be like in a post-singularity world. Technology forecasters and researchers disagree about if or when human intelligence is likely to be surpassed. Some argue that advances in artificial intelligence (AI) will probably result in general reasoning systems that lack human cognitive limitations. Others believe that humans will evolve or directly modify their biology so as to achieve radically greater intelligence. A number of futures studies scenarios combine elements from both of these possibilities, suggesting that humans are likely to interface with computers, or upload their minds to computers, in a way that enables substantial intelligence amplification. Some writers use "the singularity" in a broader way to refer to any radical changes in our society brought about by new technologies such as molecular nanotechnology, although Vinge and other writers specifically state that without superintelligence, such changes would not qualify as a true singularity. Many prominent technologists and academics dispute the plausibility of a technological singularity, including Paul Allen, Jeff Hawkins, John Holland, Jaron Lanier, and Gordon Moore, whose law is often cited in support of the concept. Most proposed methods for creating superhuman or transhuman minds fall into one of two categories: intelligence amplification of human brains and artificial intelligence. The means speculated to produce intelligence augmentation are numerous, and include bioengineering, genetic engineering, nootropic drugs, AI assistants, direct brain–computer interfaces and mind uploading. The existence of multiple paths to an intelligence explosion makes a singularity more likely; for a singularity to not occur they would all have to fail. Hanson (1998) is skeptical of human intelligence augmentation, writing that once one has exhausted the "low-hanging fruit" of easy methods for increasing human intelligence, further improvements will become increasingly difficult to find. Despite the numerous speculated means for amplifying human intelligence, non-human artificial intelligence (specifically seed AI) is the most popular option for organizations[which?] trying to advance the singularity. Whether or not an intelligence explosion occurs depends on three factors. The first accelerating factor is the new intelligence enhancements made possible by each previous improvement. Contrariwise, as the intelligences become more advanced, further advances will become more and more complicated, possibly overcoming the advantage of increased intelligence. Each improvement must be able to beget at least one more improvement, on average, for the singularity to continue. Finally the laws of physics will eventually prevent any further improvements. There are two logically independent, but mutually reinforcing causes of intelligence improvements: increases in the speed of computation, and improvements to the algorithms used. The former is predicted by Moore’s Law and the forecast improvements in hardware, and is comparatively similar to previous technological advance. On the other hand, some AI researchers[who?] believe that software is more important than hardware. A 2017 email survey of authors with publications at the 2015 NIPS and ICML machine learning conferences asked them about the chance of an intelligence explosion. 12% said it was "quite likely", 17% said it was "likely", 21% said it was "about even", 24% said it was "unlikely" and 26% said it was "quite unlikely". Belief in this idea is based on a naive understanding of what intelligence is. As an analogy, imagine we had a computer that could design new computers (chips, systems, and software) faster than itself. Would such a computer lead to infinitely fast computers or even computers that were faster than anything humans could ever build? No. It might accelerate the rate of improvements for a while, but in the end there are limits to how big and fast computers can be. We would end up in the same place; we'd just get there a bit faster. There would be no singularity. Whereas if it were a lot higher than current human levels of intelligence, the effects of the singularity would be great enough as to be indistinguishable (to humans) from a singularity with an upper limit. For example, if the speed of thought could be increased a million-fold, a subjective year would pass in 30 physical seconds. It is difficult to directly compare silicon-based hardware with neurons. But Berglas (2008) notes that computer speech recognition is approaching human capabilities, and that this capability seems to require 0.01% of the volume of the brain. This analogy suggests that modern computer hardware is within a few orders of magnitude of being as powerful as the human brain. Ray Kurzweil writes that, due to paradigm shifts, a trend of exponential growth extends Moore's law from integrated circuits to earlier transistors, vacuum tubes, relays, and electromechanical computers. He predicts that the exponential growth will continue, and that in a few decades the computing power of all computers will exceed that of ("unenhanced") human brains, with superhuman artificial intelligence appearing around the same time. An updated version of Moore's law over 120 Years (based on Kurzweil’s graph). The 7 most recent data points are all NVIDIA GPUs. The exponential growth in computing technology suggested by Moore's law is commonly cited as a reason to expect a singularity in the relatively near future, and a number of authors have proposed generalizations of Moore's law. Computer scientist and futurist Hans Moravec proposed in a 1998 book that the exponential growth curve could be extended back through earlier computing technologies prior to the integrated circuit. Ray Kurzweil postulates a law of accelerating returns in which the speed of technological change (and more generally, all evolutionary processes) increases exponentially, generalizing Moore's law in the same manner as Moravec's proposal, and also including material technology (especially as applied to nanotechnology), medical technology and others. Between 1986 and 2007, machines' application-specific capacity to compute information per capita roughly doubled every 14 months; the per capita capacity of the world's general-purpose computers has doubled every 18 months; the global telecommunication capacity per capita doubled every 34 months; and the world's storage capacity per capita doubled every 40 months. Kurzweil reserves the term "singularity" for a rapid increase in artificial intelligence (as opposed to other technologies), writing for example that "The Singularity will allow us to transcend these limitations of our biological bodies and brains ... There will be no distinction, post-Singularity, between human and machine". He also defines his predicted date of the singularity (2045) in terms of when he expects computer-based intelligences to significantly exceed the sum total of human brainpower, writing that advances in computing before that date "will not represent the Singularity" because they do "not yet correspond to a profound expansion of our intelligence." Kurzweil claims that technological progress follows a pattern of exponential growth, following what he calls the "law of accelerating returns". Whenever technology approaches a barrier, Kurzweil writes, new technologies will surmount it. He predicts paradigm shifts will become increasingly common, leading to "technological change so rapid and profound it represents a rupture in the fabric of human history". Kurzweil believes that the singularity will occur by approximately 2045. His predictions differ from Vinge's in that he predicts a gradual ascent to the singularity, rather than Vinge's rapidly self-improving superhuman intelligence. Oft-cited dangers include those commonly associated with molecular nanotechnology and genetic engineering. These threats are major issues for both singularity advocates and critics, and were the subject of Bill Joy's Wired magazine article "Why the future doesn't need us". Some intelligence technologies, like "seed AI", may also have the potential to make themselves more efficient, not just faster, by modifying their source code. These improvements would make further improvements possible, which would make further improvements possible, and so on. The mechanism for a recursively self-improving set of algorithms differs from an increase in raw computation speed in two ways. First, it does not require external influence: machines designing faster hardware would still require humans to create the improved hardware, or to program factories appropriately. An AI which was rewriting its own source code, however, could do so while contained in an AI box. Second, as with Vernor Vinge’s conception of the singularity, it is much harder to predict the outcome. While speed increases seem to be only a quantitative difference from human intelligence, actual algorithm improvements would be qualitatively different. Eliezer Yudkowsky compares it to the changes that human intelligence brought: humans changed the world thousands of times more rapidly than evolution had done, and in totally different ways. Similarly, the evolution of life had been a massive departure and acceleration from the previous geological rates of change, and improved intelligence could cause change to be as different again. There are substantial dangers associated with an intelligence explosion singularity originating from a recursively self-improving set of algorithms. First, the goal structure of the AI may not be invariant under self-improvement, potentially causing the AI to optimise for something other than was intended. Secondly, AIs could compete for the scarce resources mankind uses to survive. While not actively malicious, there is no reason to think that AIs would actively promote human goals unless they could be programmed as such, and if not, might use the resources currently used to support mankind to promote its own goals, causing human extinction. Carl Shulman and Anders Sandberg suggest that algorithm improvements may be the limiting factor for a singularity because whereas hardware efficiency tends to improve at a steady pace, software innovations are more unpredictable and may be bottlenecked by serial, cumulative research. They suggest that in the case of a software-limited singularity, intelligence explosion would actually become more likely than with a hardware-limited singularity, because in the software-limited case, once human-level AI was developed, it could run serially on very fast hardware, and the abundance of cheap hardware would make AI research less constrained. An abundance of accumulated hardware that can be unleashed once the software figures out how to use it has been called "computing overhang." Some critics, like philosopher Hubert Dreyfus, assert that computers or machines can't achieve human intelligence, while others, like physicist Stephen Hawking, hold that the definition of intelligence is irrelevant if the net result is the same. [Computers] have, literally ..., no intelligence, no motivation, no autonomy, and no agency. We design them to behave as if they had certain sorts of psychology, but there is no psychological reality to the corresponding processes or behavior. ... [T]he machinery has no beliefs, desires, [or] motivations. Martin Ford in The Lights in the Tunnel: Automation, Accelerating Technology and the Economy of the Future postulates a "technology paradox" in that before the singularity could occur most routine jobs in the economy would be automated, since this would require a level of technology inferior to that of the singularity. This would cause massive unemployment and plummeting consumer demand, which in turn would destroy the incentive to invest in the technologies that would be required to bring about the Singularity. Job displacement is increasingly no longer limited to work traditionally considered to be "routine." Theodore Modis and Jonathan Huebner argue that the rate of technological innovation has not only ceased to rise, but is actually now declining. Evidence for this decline is that the rise in computer clock rates is slowing, even while Moore's prediction of exponentially increasing circuit density continues to hold. This is due to excessive heat build-up from the chip, which cannot be dissipated quickly enough to prevent the chip from melting when operating at higher speeds. Advancements in speed may be possible in the future by virtue of more power-efficient CPU designs and multi-cell processors. While Kurzweil used Modis' resources, and Modis' work was around accelerating change, Modis distanced himself from Kurzweil's thesis of a "technological singularity", claiming that it lacks scientific rigor. Others propose that other "singularities" can be found through analysis of trends in world population, world gross domestic product, and other indices. Andrey Korotayev and others argue that historical hyperbolic growth curves can be attributed to feedback loops that ceased to affect global trends in the 1970s, and thus hyperbolic growth should not be expected in the future. In a detailed empirical accounting, The Progress of Computing, William Nordhaus argued that, prior to 1940, computers followed the much slower growth of a traditional industrial economy, thus rejecting extrapolations of Moore's law to 19th-century computers. In a 2007 paper, Schmidhuber stated that the frequency of subjectively "notable events" appears to be approaching a 21st-century singularity, but cautioned readers to take such plots of subjective events with a grain of salt: perhaps differences in memory of recent and distant events could create an illusion of accelerating change where none exists. Paul Allen argued the opposite of accelerating returns, the complexity brake; the more progress science makes towards understanding intelligence, the more difficult it becomes to make additional progress. A study of the number of patents shows that human creativity does not show accelerating returns, but in fact, as suggested by Joseph Tainter in his The Collapse of Complex Societies, a law of diminishing returns. The number of patents per thousand peaked in the period from 1850 to 1900, and has been declining since. The growth of complexity eventually becomes self-limiting, and leads to a widespread "general systems collapse". Jaron Lanier refutes the idea that the Singularity is inevitable. He states: "I do not think the technology is creating itself. It's not an autonomous process." He goes on to assert: "The reason to believe in human agency over technological determinism is that you can then have an economy where people earn their own way and invent their own lives. If you structure a society on not emphasizing individual human agency, it's the same thing operationally as denying people clout, dignity, and self-determination ... to embrace [the idea of the Singularity] would be a celebration of bad data and bad politics." Economist Robert J. Gordon, in The Rise and Fall of American Growth: The U.S. Standard of Living Since the Civil War (2016), points out that measured economic growth has slowed around 1970 and slowed even further since the financial crisis of 2008, and argues that the economic data show no trace of a coming Singularity as imagined by mathematician I.J. Good. In addition to general criticisms of the singularity concept, several critics have raised issues with Kurzweil's iconic chart. One line of criticism is that a log-log chart of this nature is inherently biased toward a straight-line result. Others identify selection bias in the points that Kurzweil chooses to use. For example, biologist PZ Myers points out that many of the early evolutionary "events" were picked arbitrarily. Kurzweil has rebutted this by charting evolutionary events from 15 neutral sources, and showing that they fit a straight line on a log-log chart. The Economist mocked the concept with a graph extrapolating that the number of blades on a razor, which has increased over the years from one to as many as five, will increase ever-faster to infinity. Dramatic changes in the rate of economic growth have occurred in the past because of some technological advancement. Based on population growth, the economy doubled every 250,000 years from the Paleolithic era until the Neolithic Revolution. The new agricultural economy doubled every 900 years, a remarkable increase. In the current era, beginning with the Industrial Revolution, the world’s economic output doubles every fifteen years, sixty times faster than during the agricultural era. If the rise of superhuman intelligence causes a similar revolution, argues Robin Hanson, one would expect the economy to double at least quarterly and possibly on a weekly basis. The term "technological singularity" reflects the idea that such change may happen suddenly, and that it is difficult to predict how the resulting new world would operate. It is unclear whether an intelligence explosion of this kind would be beneficial or harmful, or even an existential threat, as the issue has not been dealt with by most artificial general intelligence researchers, although the topic of friendly artificial intelligence is investigated by the Future of Humanity Institute and the Machine Intelligence Research Institute. Schematic Timeline of Information and Replicators in the Biosphere: Gillings et al. 's "major evolutionary transitions" in information processing. Amount of digital information worldwide (5x10^21 bytes) versus human genome information worldwide (10^19 bytes) in 2014. While the technological singularity is usually seen as a sudden event, some scholars argue the current speed of change already fits this description. In addition, some argue that we are already in the midst of a major evolutionary transition that merges technology, biology, and society. Digital technology has infiltrated the fabric of human society to a degree of indisputable and often life-sustaining dependence. A 2016 article in Trends in Ecology & Evolution argues that "humans already embrace fusions of biology and technology. We spend most of our waking time communicating through digitally mediated channels... we trust artificial intelligence with our lives through antilock braking in cars and autopilots in planes... With one in three marriages in America beginning online, digital algorithms are also taking a role in human pair bonding and reproduction". The article further argues that from the perspective of the evolution, several previous Major Transitions in Evolution have transformed life through innovations in information storage and replication (RNA, DNA, multicellularity, and culture and language). 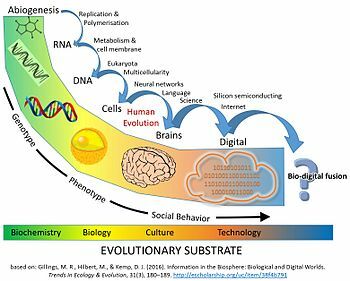 In the current stage of life's evolution, the carbon-based biosphere has generated a cognitive system (humans) capable of creating technology that will result in a comparable evolutionary transition. 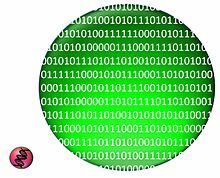 The digital information created by humans has reached a similar magnitude to biological information in the biosphere. Since the 1980s, "the quantity of digital information stored has doubled about every 2.5 years, reaching about 5 zettabytes in 2014 (5x10^21 bytes). In biological terms, there are 7.2 billion humans on the planet, each having a genome of 6.2 billion nucleotides. Since one byte can encode four nucleotide pairs, the individual genomes of every human on the planet could be encoded by approximately 1x10^19 bytes. The digital realm stored 500 times more information than this in 2014 (see figure). The total amount of DNA contained in all of the cells on Earth is estimated to be about 5.3x10^37 base pairs, equivalent to 1.325x10^37 bytes of information. If growth in digital storage continues at its current rate of 30–38% compound annual growth per year, it will rival the total information content contained in all of the DNA in all of the cells on Earth in about 110 years. This would represent a doubling of the amount of information stored in the biosphere across a total time period of just 150 years". In February 2009, under the auspices of the Association for the Advancement of Artificial Intelligence (AAAI), Eric Horvitz chaired a meeting of leading computer scientists, artificial intelligence researchers and roboticists at Asilomar in Pacific Grove, California. The goal was to discuss the potential impact of the hypothetical possibility that robots could become self-sufficient and able to make their own decisions. They discussed the extent to which computers and robots might be able to acquire autonomy, and to what degree they could use such abilities to pose threats or hazards. Some machines are programmed with various forms of semi-autonomy, including the ability to locate their own power sources and choose targets to attack with weapons. Also, some computer viruses can evade elimination and, according to scientists in attendance, could therefore be said to have reached a "cockroach" stage of machine intelligence. The conference attendees noted that self-awareness as depicted in science-fiction is probably unlikely, but that other potential hazards and pitfalls exist. Berglas (2008) claims that there is no direct evolutionary motivation for an AI to be friendly to humans. Evolution has no inherent tendency to produce outcomes valued by humans, and there is little reason to expect an arbitrary optimisation process to promote an outcome desired by mankind, rather than inadvertently leading to an AI behaving in a way not intended by its creators (such as Nick Bostrom's whimsical example of an AI which was originally programmed with the goal of manufacturing paper clips, so that when it achieves superintelligence it decides to convert the entire planet into a paper clip manufacturing facility). Anders Sandberg has also elaborated on this scenario, addressing various common counter-arguments. AI researcher Hugo de Garis suggests that artificial intelligences may simply eliminate the human race for access to scarce resources, and humans would be powerless to stop them. Alternatively, AIs developed under evolutionary pressure to promote their own survival could outcompete humanity. A significant problem is that unfriendly artificial intelligence is likely to be much easier to create than friendly AI. While both require large advances in recursive optimisation process design, friendly AI also requires the ability to make goal structures invariant under self-improvement (or the AI could transform itself into something unfriendly) and a goal structure that aligns with human values and does not automatically destroy the human race. An unfriendly AI, on the other hand, can optimize for an arbitrary goal structure, which does not need to be invariant under self-modification. Eliezer Yudkowsky proposed that research be undertaken to produce friendly artificial intelligence in order to address the dangers. He noted that the first real AI would have a head start on self-improvement and, if friendly, could prevent unfriendly AIs from developing, as well as providing enormous benefits to mankind. Bill Hibbard (2014) proposes an AI design that avoids several dangers including self-delusion, unintended instrumental actions, and corruption of the reward generator. He also discusses social impacts of AI and testing AI. His 2001 book Super-Intelligent Machines advocates the need for public education about AI and public control over AI. It also proposed a simple design that was vulnerable to corruption of the reward generator. One hypothetical approach towards attempting to control an artificial intelligence is an AI box, where the artificial intelligence is kept constrained inside a simulated world and not allowed to affect the external world. However, a sufficiently intelligent AI may simply be able to escape by outsmarting its less intelligent human captors. So, facing possible futures of incalculable benefits and risks, the experts are surely doing everything possible to ensure the best outcome, right? Wrong. If a superior alien civilisation sent us a message saying, "We'll arrive in a few decades," would we just reply, "OK, call us when you get here – we'll leave the lights on"? Probably not – but this is more or less what is happening with AI. In this sample recursive self-improvement scenario, humans modifying an AI's architecture would be able to double its performance every three years through, for example, 30 generations before exhausting all feasible improvements (left). If instead the AI is smart enough to modify its own architecture as well as human researchers can, its time required to complete a redesign halves with each generation, and it progresses all 30 feasible generations in six years (right). In a hard takeoff scenario, an AGI rapidly self-improves, "taking control" of the world (perhaps in a matter of hours), too quickly for significant human-initiated error correction or for a gradual tuning of the AGI's goals. In a soft takeoff scenario, AGI still becomes far more powerful than humanity, but at a human-like pace (perhaps on the order of decades), on a timescale where ongoing human interaction and correction can effectively steer the AGI's development. Ramez Naam argues against a hard takeoff by pointing out that we already see recursive self-improvement by superintelligences, such as corporations. For instance, Intel has "the collective brainpower of tens of thousands of humans and probably millions of CPU cores to.. design better CPUs!" However, this has not led to a hard takeoff; rather, it has led to a soft takeoff in the form of Moore's law. Naam further points out that the computational complexity of higher intelligence may be much greater than linear, such that "creating a mind of intelligence 2 is probably more than twice as hard as creating a mind of intelligence 1." J. Storrs Hall believes that "many of the more commonly seen scenarios for overnight hard takeoff are circular – they seem to assume hyperhuman capabilities at the starting point of the self-improvement process" in order for an AI to be able to make the dramatic, domain-general improvements required for takeoff. Hall suggests that rather than recursively self-improving its hardware, software, and infrastructure all on its own, a fledgling AI would be better off specializing in one area where it was most effective and then buying the remaining components on the marketplace, because the quality of products on the marketplace continually improves, and the AI would have a hard time keeping up with the cutting-edge technology used by the rest of the world. Ben Goertzel agrees with Hall's suggestion that a new human-level AI would do well to use its intelligence to accumulate wealth. The AI's talents might inspire companies and governments to disperse its software throughout society. Goertzel is skeptical of a very hard, 5-minute takeoff but thinks a takeoff from human to superhuman level on the order of 5 years is reasonable. He calls this a "semihard takeoff". Max More disagrees, arguing that if there were only a few superfast human-level AIs, they wouldn't radically change the world, because they would still depend on other people to get things done and would still have human cognitive constraints. Even if all superfast AIs worked on intelligence augmentation, it's not clear why they would do better in a discontinuous way than existing human cognitive scientists at producing super-human intelligence, although the rate of progress would increase. More also argues that a superintelligence would not transform the world overnight, because a superintelligence would need to engage with existing, slow human systems to accomplish physical impacts on the world. "The need for collaboration, for organization, and for putting ideas into physical changes will ensure that all the old rules are not thrown out overnight or even within years." In his 2005 book, The Singularity is Near, Kurzweil suggests that medical advances would allow people to protect their bodies from the effects of aging, making the life expectancy limitless. Kurzweil argues that the technological advances in medicine would allow us to continuously repair and replace defective components in our bodies, prolonging life to an undetermined age. Kurzweil further buttresses his argument by discussing current bio-engineering advances. Kurzweil suggests somatic gene therapy; after synthetic viruses with specific genetic information, the next step would be to apply this technology to gene therapy, replacing human DNA with synthesized genes. K. Eric Drexler, one of the founders of nanotechnology, postulated cell repair devices, including ones operating within cells and utilizing as yet hypothetical biological machines, in his 1986 book Engines of Creation. According to Richard Feynman, it was his former graduate student and collaborator Albert Hibbs who originally suggested to him (circa 1959) the idea of a medical use for Feynman's theoretical micromachines. Hibbs suggested that certain repair machines might one day be reduced in size to the point that it would, in theory, be possible to (as Feynman put it) "swallow the doctor". The idea was incorporated into Feynman's 1959 essay There's Plenty of Room at the Bottom. Beyond merely extending the operational life of the physical body, Jaron Lanier argues for a form of immortality called "Digital Ascension" that involves "people dying in the flesh and being uploaded into a computer and remaining conscious". In his 1958 obituary for John von Neumann, Ulam recalled a conversation with von Neumann about the "ever accelerating progress of technology and changes in the mode of human life, which gives the appearance of approaching some essential singularity in the history of the race beyond which human affairs, as we know them, could not continue." In 1965, Good wrote his essay postulating an "intelligence explosion" of recursive self-improvement of a machine intelligence. In 1981, Stanisław Lem published his science fiction novel Golem XIV. It describes a military AI computer (Golem XIV) who obtains consciousness and starts to increase his own intelligence, moving towards personal technological singularity. Golem XIV was originally created to aid its builders in fighting wars, but as its intelligence advances to a much higher level than that of humans, it stops being interested in the military requirement because it finds them lacking internal logical consistency. We will soon create intelligences greater than our own. When this happens, human history will have reached a kind of singularity, an intellectual transition as impenetrable as the knotted space-time at the center of a black hole, and the world will pass far beyond our understanding. This singularity, I believe, already haunts a number of science-fiction writers. It makes realistic extrapolation to an interstellar future impossible. To write a story set more than a century hence, one needs a nuclear war in between ... so that the world remains intelligible. In 1985, in "The Time Scale of Artificial Intelligence", artificial intelligence researcher Ray Solomonoff articulated mathematically the related notion of what he called an "infinity point": if a research community of human-level self-improving AIs take four years to double their own speed, then two years, then one year and so on, their capabilities increase infinitely in finite time. Vinge's 1993 article "The Coming Technological Singularity: How to Survive in the Post-Human Era", spread widely on the internet and helped to popularize the idea. This article contains the statement, "Within thirty years, we will have the technological means to create superhuman intelligence. Shortly after, the human era will be ended." Vinge argues that science-fiction authors cannot write realistic post-singularity characters who surpass the human intellect, as the thoughts of such an intellect would be beyond the ability of humans to express. In 2000, Bill Joy, a prominent technologist and a co-founder of Sun Microsystems, voiced concern over the potential dangers of the singularity. In 2005, Kurzweil published The Singularity is Near. Kurzweil's publicity campaign included an appearance on The Daily Show with Jon Stewart. In 2007, Eliezer Yudkowsky suggested that many of the varied definitions that have been assigned to "singularity" are mutually incompatible rather than mutually supporting. For example, Kurzweil extrapolates current technological trajectories past the arrival of self-improving AI or superhuman intelligence, which Yudkowsky argues represents a tension with both I. J. Good's proposed discontinuous upswing in intelligence and Vinge's thesis on unpredictability. In 2009, Kurzweil and X-Prize founder Peter Diamandis announced the establishment of Singularity University, a nonaccredited private institute whose stated mission is "to educate, inspire and empower leaders to apply exponential technologies to address humanity's grand challenges." Funded by Google, Autodesk, ePlanet Ventures, and a group of technology industry leaders, Singularity University is based at NASA's Ames Research Center in Mountain View, California. The not-for-profit organization runs an annual ten-week graduate program during summer that covers ten different technology and allied tracks, and a series of executive programs throughout the year. In 2007, the joint Economic Committee of the United States Congress released a report about the future of nanotechnology. It predicts significant technological and political changes in the mid-term future, including possible technological singularity. One thing that we haven't talked about too much, and I just want to go back to, is we really have to think through the economic implications. Because most people aren't spending a lot of time right now worrying about singularity—they are worrying about "Well, is my job going to be replaced by a machine?" ^ Cadwalladr, Carole (2014). "Are the robots about to rise? Google's new director of engineering thinks so…" The Guardian. Guardian News and Media Limited. ^ "Collection of sources defining "singularity"". singularitysymposium.com. Retrieved 17 April 2019. ^ a b Eden, Amnon H.; Moor, James H. (2012). Singularity hypotheses: A Scientific and Philosophical Assessment. Dordrecht: Springer. pp. 1–2. ISBN 9783642325601. ^ a b c Ulam, Stanislaw (May 1958). "Tribute to John von Neumann" (PDF). 64, #3, part 2. Bulletin of the American Mathematical Society: 5. ^ a b c Chalmers, David (2010). "The singularity: a philosophical analysis". Journal of Consciousness Studies. 17 (9–10): 7–65. ^ a b c d e f Vinge, Vernor. "The Coming Technological Singularity: How to Survive in the Post-Human Era", in Vision-21: Interdisciplinary Science and Engineering in the Era of Cyberspace, G. A. Landis, ed., NASA Publication CP-10129, pp. 11–22, 1993. ^ Khatchadourian, Raffi (16 November 2015). "The Doomsday Invention". The New Yorker. Retrieved 31 January 2018. ^ Sparkes, Matthew (13 January 2015). "Top scientists call for caution over artificial intelligence". The Telegraph (UK). Retrieved 24 April 2015. ^ "Hawking: AI could end human race". BBC. 2 December 2014. Retrieved 11 November 2017. ^ a b Yampolskiy, Roman V. "Analysis of types of self-improving software." Artificial General Intelligence. Springer International Publishing, 2015. 384-393. ^ Ray Kurzweil, The Singularity is Near, pp. 135–136. Penguin Group, 2005. ^ "h+ Magazine | Covering technological, scientific, and cultural trends that are changing human beings in fundamental ways". Hplusmagazine.com. Retrieved 2011-09-09. ^ a b "Tech Luminaries Address Singularity – IEEE Spectrum". Spectrum.ieee.org. Retrieved 2011-09-09. ^ "Who's Who In The Singularity – IEEE Spectrum". Spectrum.ieee.org. Retrieved 2011-09-09. ^ a b "What is the Singularity? | Singularity Institute for Artificial Intelligence". Singinst.org. Archived from the original on 2011-09-08. Retrieved 2011-09-09. ^ David Chalmers John Locke Lecture, 10 May, Exam Schools, Oxford, Presenting a philosophical analysis of the possibility of a technological singularity or "intelligence explosion" resulting from recursively self-improving AI Archived 2013-01-15 at the Wayback Machine. ^ "ITRS" (PDF). Archived from the original (PDF) on 2011-09-29. Retrieved 2011-09-09. ^ Kulkarni, Ajit (2017-12-12). "Why Software Is More Important Than Hardware Right Now". Chronicled. Retrieved 2019-02-23. ^ Grace, Katja; Salvatier, John; Dafoe, Allan; Zhang, Baobao; Evans, Owain (24 May 2017). "When Will AI Exceed Human Performance? Evidence from AI Experts". arXiv:1705.08807 [cs.AI]. ^ Siracusa, John (2009-08-31). "Mac OS X 10.6 Snow Leopard: the Ars Technica review". Arstechnica.com. Retrieved 2011-09-09. ^ Eliezer Yudkowsky, 1996 "Staring into the Singularity"
^ Moravec, Hans (1999). Robot: Mere Machine to Transcendent Mind. Oxford U. Press. p. 61. ISBN 978-0-19-513630-2. ^ Ray Kurzweil, The Singularity is Near, pp. 135–136. Penguin Group, 2005. "So we will be producing about 1026 to 1029 cps of nonbiological computation per year in the early 2030s. This is roughly equal to our estimate for the capacity of all living biological human intelligence ... This state of computation in the early 2030s will not represent the Singularity, however, because it does not yet correspond to a profound expansion of our intelligence. By the mid-2040s, however, that one thousand dollars' worth of computation will be equal to 1026 cps, so the intelligence created per year (at a total cost of about $1012) will be about one billion times more powerful than all human intelligence today. That will indeed represent a profound change, and it is for that reason that I set the date for the Singularity—representing a profound and disruptive transformation in human capability—as 2045." ^ Eliezer S. Yudkowsky. "Power of Intelligence". Yudkowsky. Retrieved 2011-09-09. ^ "Artificial General Intelligence: Now Is the Time". KurzweilAI. Retrieved 2011-09-09. ^ a b Omohundro, Stephen M., "The Nature of Self-Improving Artificial Intelligence." Self-Aware Systems. 21 Jan. 2008. Web. 07 Jan. 2010. ^ Barrat, James (2013). "6, "Four Basic Drives"". Our Final Invention (First ed.). New York: St. Martin's Press. pp. 78–98. ISBN 978-0312622374. ^ "Max More and Ray Kurzweil on the Singularity". KurzweilAI. Retrieved 2011-09-09. ^ a b "Concise Summary | Singularity Institute for Artificial Intelligence". Singinst.org. Retrieved 2011-09-09. ^ a b Bostrom, Nick, The Future of Human Evolution, Death and Anti-Death: Two Hundred Years After Kant, Fifty Years After Turing, ed. Charles Tandy, pp. 339–371, 2004, Ria University Press. ^ Shulman, Carl; Anders Sandberg (2010). Mainzer, Klaus, ed. "Implications of a Software-Limited Singularity" (PDF). ECAP10: VIII European Conference on Computing and Philosophy. Retrieved 17 May 2014. ^ Muehlhauser, Luke; Anna Salamon (2012). "Intelligence Explosion: Evidence and Import" (PDF). In Amnon Eden; Johnny Søraker; James H. Moor; Eric Steinhart. Singularity Hypotheses: A Scientific and Philosophical Assessment. Springer. ^ John R. Searle, “What Your Computer Can’t Know”, The New York Review of Books, 9 October 2014, p. 54. ^ Markoff, John (2011-03-04). "Armies of Expensive Lawyers, Replaced by Cheaper Software". The New York Times. ^ Krazit, Tom. Intel pledges 80 cores in five years, CNET News, 26 September 2006. ^ Korotayev, Andrey (2018). "The 21st Century Singularity and its Big History Implications: A re-analysis". Journal of Big History. 2 (3): 71–118. doi:10.22339/jbh.v2i3.2320. ^ LePoire D. Potential Economic and Energy Indicators of Inflection in Complexity. Evolution 3 (2013): 108–118. ^ Nordhaus, William D. (2007). "Two Centuries of Productivity Growth in Computing". The Journal of Economic History. 67. CiteSeerX 10.1.1.330.1871. doi:10.1017/S0022050707000058. ^ Schmidhuber, Jürgen. "New millennium AI and the convergence of history." Challenges for computational intelligence. Springer Berlin Heidelberg, 2007. 15–35. ^ a b Jaron Lanier (2013). "Who Owns the Future?". New York: Simon & Schuster. ^ William D. Nordhaus, "Why Growth Will Fall" (a review of Robert J. Gordon, The Rise and Fall of American Growth: The U.S. Standard of Living Since the Civil War, Princeton University Press, 2016, ISBN 978-0691147727, 762 pp., $39.95), The New York Review of Books, vol. LXIII, no. 13 (August 18, 2016), p. 68. ^ "The Uncertain Future". theuncertainfuture.com; a future technology and world-modeling project. ^ "GLOBAL CATASTROPHIC RISKS SURVEY (2008) Technical Report 2008/1 Published by Future of Humanity Institute, Oxford University. Anders Sandberg and Nick Bostrom" (PDF). Archived from the original (PDF) on 2011-05-16. ^ "Existential Risks: Analyzing Human Extinction Scenarios and Related Hazards". nickbostrom.com. ^ a b c Kemp, D. J.; Hilbert, M.; Gillings, M. R. (2016). "Information in the Biosphere: Biological and Digital Worlds". Trends in Ecology & Evolution. 31 (3): 180–189. doi:10.1016/j.tree.2015.12.013. PMID 26777788. ^ Omohundro, Stephen M., "The Basic AI Drives." Artificial General Intelligence, 2008 proceedings of the First AGI Conference, eds. Pei Wang, Ben Goertzel, and Stan Franklin. Vol. 171. Amsterdam: IOS, 2008. ^ de Garis, Hugo. "The Coming Artilect War", Forbes.com, 22 June 2009. ^ Hibbard, Bill (2012), "Model-Based Utility Functions", Journal of Artificial General Intelligence, 3 (1): 1, arXiv:1111.3934, Bibcode:2012JAGI....3....1H, doi:10.2478/v10229-011-0013-5. ^ a b Avoiding Unintended AI Behaviors. Bill Hibbard. 2012 proceedings of the Fifth Conference on Artificial General Intelligence, eds. Joscha Bach, Ben Goertzel and Matthew Ikle. This paper won the Machine Intelligence Research Institute's 2012 Turing Prize for the Best AGI Safety Paper. ^ Hibbard, Bill (2008), "The Technology of Mind and a New Social Contract", Journal of Evolution and Technology, 17. ^ Decision Support for Safe AI Design|. Bill Hibbard. 2012 proceedings of the Fifth Conference on Artificial General Intelligence, eds. Joscha Bach, Ben Goertzel and Matthew Ikle. ^ Stephen Hawking (1 May 2014). "Stephen Hawking: 'Transcendence looks at the implications of artificial intelligence - but are we taking AI seriously enough?'". The Independent. Retrieved May 5, 2014. ^ Eliezer Yudkowsky. "Artificial intelligence as a positive and negative factor in global risk." Global catastrophic risks (2008). ^ Bugaj, Stephan Vladimir, and Ben Goertzel. "Five ethical imperatives and their implications for human-AGI interaction." Dynamical Psychology (2007). ^ Sotala, Kaj, and Roman V. Yampolskiy. "Responses to catastrophic AGI risk: a survey." Physica Scripta 90.1 (2014): 018001. ^ Naam, Ramez (2014). "The Singularity Is Further Than It Appears". Retrieved 16 May 2014. ^ Naam, Ramez (2014). "Why AIs Won't Ascend in the Blink of an Eye - Some Math". Retrieved 16 May 2014. ^ Hall, J. Storrs (2008). "Engineering Utopia" (PDF). Artificial General Intelligence, 2008: Proceedings of the First AGI Conference: 460–467. Retrieved 16 May 2014. ^ Goertzel, Ben (26 Sep 2014). "Superintelligence — Semi-hard Takeoff Scenarios". h+ Magazine. Retrieved 25 October 2014. ^ More, Max. "Singularity Meets Economy". Retrieved 10 November 2014. ^ The Singularity is Near, p.216. ^ Richard P. Feynman (December 1959). "There's Plenty of Room at the Bottom". Archived from the original on 2010-02-11. ^ Lanier, Jaron (2010). You Are Not a Gadget: A Manifesto. New York: Alfred A. Knopf. p. 26. ISBN 978-0307269645. ^ Vinge did not actually use the phrase "technological singularity" in the Omni op-ed, but he did use this phrase in the short story collection Threats and Other Promises from 1988, writing in the introduction to his story "The Whirligig of Time" (p. 72): Barring a worldwide catastrophe, I believe that technology will achieve our wildest dreams, and soon. When we raise our own intelligence and that of our creations, we are no longer in a world of human-sized characters. At that point we have fallen into a technological "black hole," a technological singularity. ^ Solomonoff, R.J. "The Time Scale of Artificial Intelligence: Reflections on Social Effects", Human Systems Management, Vol 5, pp. 149–153, 1985. ^ Sandberg, Anders. "An overview of models of technological singularity." Roadmaps to AGI and the Future of AGI Workshop, Lugano, Switzerland, March. Vol. 8. 2010. ^ Guston, David H. (14 July 2010). Encyclopedia of Nanoscience and Society. SAGE Publications. ISBN 978-1-4522-6617-6. ^ "Nanotechnology: The Future is Coming Sooner Than You Think" (PDF). Joint Economic Committee. March 2007. ^ "Congress and the Singularity". ^ Dadich, Scott. "Barack Obama Talks AI, Robo Cars, and the Future of the World". Kurzweil, Ray (2005). The Singularity is Near. New York: Penguin Group. ISBN 9780715635612. William D. Nordhaus, "Why Growth Will Fall" (a review of Robert J. Gordon, The Rise and Fall of American Growth: The U.S. Standard of Living Since the Civil War, Princeton University Press, 2016, ISBN 978-0691147727, 762 pp., $39.95), The New York Review of Books, vol. LXIII, no. 13 (August 18, 2016), pp. 64, 66, 68. John R. Searle, “What Your Computer Can’t Know” (review of Luciano Floridi, The Fourth Revolution: How the Infosphere Is Reshaping Human Reality, Oxford University Press, 2014; and Nick Bostrom, Superintelligence: Paths, Dangers, Strategies, Oxford University Press, 2014), The New York Review of Books, vol. LXI, no. 15 (October 9, 2014), pp. 52–55. Hibbard, Bill (5 November 2014). "Ethical Artificial Intelligence". arXiv:1411.1373 [cs.AI]. Scaruffi, Piero, "Intelligence is not Artificial" (2016) for a critique of the singularity movement and its similarities to religious cults.